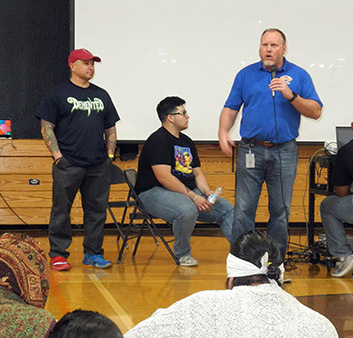 James Torrez, owner of Demented Customs in Hobbs, was the guest speaker during Thursday’s Hermosa Elementary School Family Night. Principal Mike Worley and his committee of teachers came up with an idea to connect parents with students in a way that was “something out of the norm — other than a science night or simply reading to the kids.” And from that, the idea, hatched and implemented with the help of Debbie Bell and HollyFrontier, to have Torrez and his sons, CJ and Gerald, speak with students and parents, then issue a challenge. He came to challenge the students at Hermosa to “dream big” and work alongside their parents on that dream. HollyFrontier also purchased 340 “kit cars,” one for every student at Hermosa, and 150 pizzas to feed the students and their parents during the Family Night, and Worley challenged the kids to take the cars home and build them with their parents or caregivers. The cars may be customized to each individual student’s ideas, and the school will then hold a car show in the near future, for which Torrez and his sons will return to judge and bring one of the life-sized custom cars they have built together as a team.